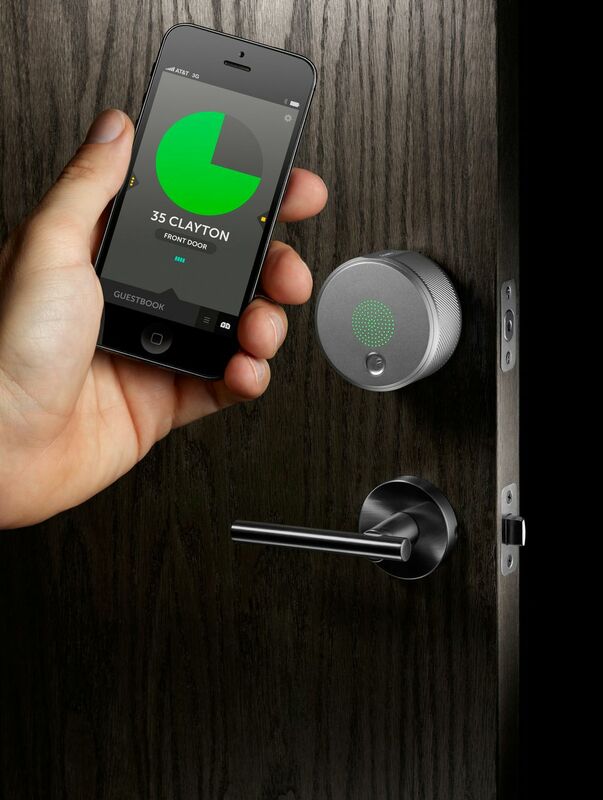 Locks are not only the gatekeeper to your home, but they are also a gateway to building out a connected home. Which is why August, a company building a connected lock is worth a look. The startup, which was formed last year, has built a Bluetooth lock that’s pretty, social and in the same price range as other connected locks. The service lets you open your door without a key, but it also lets you set times that your door could be unlocked by people you’ve invited into your home. So you might send a plumber the code to unlock your house set for a one-hour window, or you could invite your friends over for a barbecue and they could wander in during a multi-hour window without having to wait for you to let them in. You send or revoke invites from the app on your smartphone, although you can also still open the door using a key if you want (or if your battery dies in your handset). From a user perspective the most important thing you need to know about the August lock is that the use of Bluetooth means you won’t have to take out your phone and use an app in order to open your door. The Bluetooth radio in your phone (or a friend’s phone if you send them the code via text or email) is enough to trigger the door. This is nice, since other options on the market such as the Lockitron (on older iOS(s aapl) and Android phones that don’t have native Bluetooth support(s goog)) or specialty products require an app and sometimes even a gateway in the house. But the August lock, designed by Yves Béhar, may benefit you if you do decide to take out your phone. The service provided with the lock (there’s always a service element for the best connected devices) lets people leave “notes” for people who trigger the lock that can be sent via the August app. So if your guest opens the door, you can send them a note about the alarm code once they’re inside or tell them that they can find clean towels in the laundry room. If it’s your husband you can ask him to empty the dishwasher. I think it would be awesome to sync the locking service to my Evernote account so I could set myself reminders for when I leave the house. That’s not a feature offered yet, but imagine a situation in which my daughter locked the door every Wednesday as she was leaving for school, and she got a reminder asking if she has her karate bag. The locking or unlocking of the front door is a more exact way to pinpoint when someone leaves, as opposed to GPS or Wi-Fi. In our interview, Béhar also was excited about the social aspects of leaving notes for people after you left the house. I personally could care less if someone who came over for a barbecue leaves a note telling me they liked the ribs, but I am a bit of a curmudgeon. There are plenty of people who will like the social aspects associated with the lock. Plus, technology like this will help overcome some of the physical hurdles in the sharing economy. Being able to grant access via an app is a lot easier than meeting someone to hand over a set of keys. However, when paired with other services, or even on its own, I think this is a lock worth looking at when it comes out in the fourth quarter of this year. Jason Johnson, a co-founder, said the price would be less than $200 and installation is about a 10-minute endeavor. The lock requires four double A batteries that should last about 6 months (Johnson says it may last up to a year). August has developed a secure layer on top of the Bluetooth protocol to add a level of security. They also won’t let you send someone an access code to get into the house with the home address, although a diligent search through previous emails or texts on a stolen phone might reveal that. And if you’re like me and wonder how to give people (small children, Luddites) access to your home if they don’t carry a smartphone, Johnson says they are looking at providing a way to let other Bluetooth devices such as personal fitness trackers or even specialty dongles work with the lock. i may be wrong, but i think it has dual antennas and can tell what side of the door you’re on. so if you’re on the inside it doesn’t inadvertantly unlock when your near the door. If your security practices are such that you leave your doors unlocked when you are home, then this would be fine. But otherwise, having your doors unlock when your device is simply in proximity to a door is not really adequate security. Imagine the door bell rings and you go to see who is there. Do you really want the door to unlock? Man, I am shamed that i didn’t think of this. I was so worried about what happens when your battery runs out and computer security ….